Kirk, Spock, Sulu, Uhuru, Scotty, Bones, Chekov, and all the hot young yeomen of both sexes who died horribly in Kirk’s arms before the end of the first act all appeared for the first time on NBC television 50 years ago on Sept. 8. Together with “M*A*S*H,” “Star Trek” dominated my post-Children’s Television Workshop viewing habits, and the quality of the writing in those original three years set a seminal benchmark that remains unsurpassed. Please don’t misunderstand: In an era of computer generated effects, the original series seems quaint or cheesy, and it requires a level of suspension of disbelief contemporary viewers are unused to. But the scripts of some of those early Hugo award winning shows are just amazingly timeless and creative. According to Richard Arnold, personal assistant to series creator Gene Roddenberry from the ‘70s until Roddenberry’s death in 1991, “Gene’s litmus test for a great ‘Star Trek’ story was, ‘Can you tell it today? Can you tell it 100 years ago? Can you tell it in the future?’ Does it require science fiction hardware to make it work? Because if it does, it’s not a good ‘Star Trek’ story. It has to be about people. It has to be about the human condition … It’s one of the few places you can go to get those positive visions of the future,” Arnold said. A veteran of WWII’s Pacific theater and a former LA cop, franchise creator Gene Roddenberry was strongly committed to a social vision “framed in negotiation, mutual understanding and compromise,” according to Michael Newton of The Guardian. Very little real evil is evidenced in Star Trek: “more usually there’s merely petulance or misunderstanding, hurt or fear. It’s a matter of survival, not evil; it’s rare to find someone who wishes to conquer the galaxy … The receding frontier (of space) was always central to an idea originally pitched by Roddenberry as ‘Wagon Train’ in space,” Newton adds. 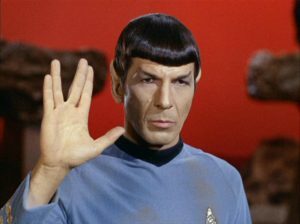 “Star Trek” depends upon the balance between Kirk and Spock, a union of diverse opposites. The charisma of Shatner’s Kirk is that of an all-American hero, a college sports star dispensing justice for the universe. Nimoy’s Spock faces him with urbane, reflective stillness, a strangely comforting presence. DeForest Kelley is a decade older than Shatner and Nimoy, and his role usually was to provide an irascibly choleric, spluttering figure of conscience, bluntly defining the captain’s moral dilemmas. Bryan Fuller, executive producer of the new “Star Trek: Discovery” series that will premier early next year, emphasized Roddenberry’s original humanist, inclusive vision for “Star Trek” at the San Diego ComicCon last July. “I think what the new series has to do is remind the audience about the message of ‘Star Trek’ … to continue to be progressive, push boundaries and continue telling stories in the legacy that Gene Roddenberry promised, which is giving us hope for a future,” Fuller said.